Dominic Ball remembers Sean Dyche’s tough love approach to coaching and sees the success he has achieved as no surprise. 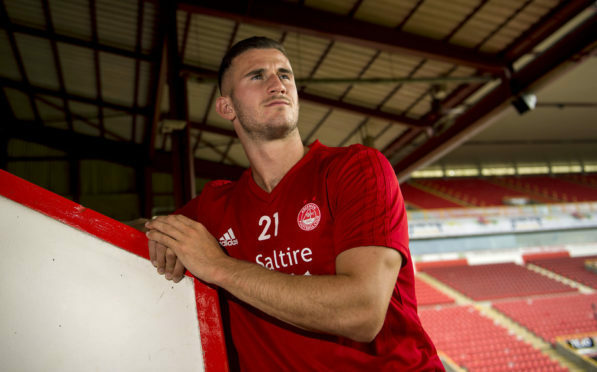 Dons loanee Ball was coached by Dyche during his time as a youth player at Watford and comes up against his former mentor on Tuesday night in the Europa League tie with Burnley. Dyche was a youth coach with the Hornets from 2007 to 2009 and later managed the Vicarage Road club. He joined Burnley in 2012 and has led them to two promotions, as well as their first appearance in Europe in more than 50 years. It brings back fond memories for Ball who, in the infancy of his career, experienced the brand of man-management that has taken Dyche to the upper echelons of the English game. Ball said: “He was strong and tough but a very good coach. You can see how well he’s done. At that stage, I’m dreaming of being a professional footballer, without actually thinking about it happening. You’re just enjoying your football. But what he’s done has been amazing. “His style of coaching, from what I remember, was very composed. He had a lot of authority and got everyone’s attention – he’s taken that forward with Burnley. I didn’t directly work under him but he coached two age groups and you just knew it was him. Much of the expectation heading into Thursday’s first leg is for the Clarets to emerge victorious but Ball will not discount his own side’s chances. They went to Parkhead on the final day of last season and ended a run of 25 league defeats on Celtic’s home patch to secure second spot, with that underdog mentality likely to serve the Dons well over this second qualifying round tie. Ball said: “There could be that perception (Burnley can’t afford to lose) but there’s a pressure from our fans to go and compete against Burnley. They’re a top side but we showed last year we’re a top side too. “Even before I came up, the perception was the English league is a lot better than the Scottish one. Some people still won’t rate the Scottish league. But I’ve come up for the third time and it’s because of the standard. You can’t judge something if you don’t know about it; you see more and more English players coming up now.